Hyperbole is a dangerous thing. The more hype a film gets, the greater the likelihood that it will ultimately disappoint. Raising an audience’s expectations to the level that they start expecting not only perfection, but a downright revolution in cinema as well, is just tempting fate. One Cut of the Dead has been riding a hype train for over a year now, since its initial limited release in Japan. This is a film which according the IMDB trivia page, has made 1000 times its initial $25,000 budget back, all on word of mouth. My Twitter feed has been full of people lauding its brilliance, praising its originality for months and months. In comparison most trending films barely last a week on Twitter. Naturally Third Window Films have been championing its cause; they are distributing the film after all, and now, finally the check discs have arrived, and I’m sitting there, stone faced, staring down a year of pure hype, daring it to live up to its promise. “One Cut of the Dead”, you’d better be good. An over-stressed director is trying to make a zombie movie in a decommissioned water filtration plant, but he’s not having a lot of luck getting his actors to feel the emotion. You’d think they might get some inspiration from the location; after all, there is an urban legend that the Japanese military once conducted experiments on raising the dead there. It turns out that it’s not just an urban legend when real zombies attack the film shoot. One Cut of the Dead gets a 1.78:1 widescreen 1080p transfer on the first disc, which is perfectly fine. Sure, the first act has the naturalistic, digital, low-budget feel of a found footage horror movie, but thereafter the quality of the presentation can’t be faulted, clear and sharp, with excellent detail and strong consistent colours. The audio is in DTS-HD MA 2.0 Japanese stereo format with optional English subtitles. The all important dialogue is clear, any moment of action is presented robustly, and I love the film’s end theme. You have two BD 25s in this collection, which implies that it could all have been gathered onto one Blu-ray. This feels like one of those licensor stipulations that restrict any extra features to the Limited Edition release only. It’s well worth getting this version as the extras are quite sweet. Both discs get animated menus (the extras disc has that catchy end theme), and the only extra on the movie disc is the theatrical trailer. On disc 2, the first thing you’ll note is the “Take 8” (2016) Short Film which lasts 19:53. It plays with a similar idea to the main feature, but takes it in a completely different direction and is very entertaining. The Making of One Cut of the Dead lasts 43:56, a comprehensive behind the scenes look. The director Shinichiro Ueda is interviewed for 17:35. I have yet to watch the Go-Pro version of One Cut of the Dead, which runs to 38:02. The Pom Instruction video is the same as that presented in the movie, here in its full screen glory lasting 0:58. Pom! Finally there are 4:36 of Outtakes. I haven’t seen the packaging to comment. Oh my word! The hype isn’t only justified, it’s understated. It makes sense with a movie that so relies on its surprises, that the word of mouth is utterly effusive with praise, but absent almost any detail. And it will be no surprise that I will be just as vague in this review. Actually, stop reading, go and buy the film or watch it in the cinema, and once you’re done, come back, or not, as you won’t really need to, as you’ll have just watched the best film that you will see this year. Actually, it’s the best film I’ve seen in many a year. It’s reminded me of why I love cinema in the first place. It’s fantastic! Still here? Well, I’ll just waffle on a bit, hopefully without letting any cats out of the bag. In fact, I’ll have to be careful with what screen-grabs I take of the film. The zombie movie is dead, or undead as the case may be. It’s a genre that pretty much shot its bolt with the initial wave of films. There’s only so much you can do with the character-less inexorable tide of the living dead, only so many allegories you can make to commercialism, the Red Menace, television addiction and so forth before it all wears out. In my lifetime, I don’t think I’ve seen a single bona fide zombie movie. They’ve all been subversions of the genre, spoofs and satires, or re-inventions. My zombie experience has included films like Dead Meat (the Mad Cow zombies), Eaters: Rise of the Dead (the one with Pulp Fiction dialogue and the midget Hitler), Resident Evil (videogame zombies) and I still have Shaun of the Dead on my to-watch pile. I’m currently watching an anime called Sankarea, where a zombie otaku actually creates a zombie girlfriend for himself. You have to be creative to grab the audience’s attention these days. 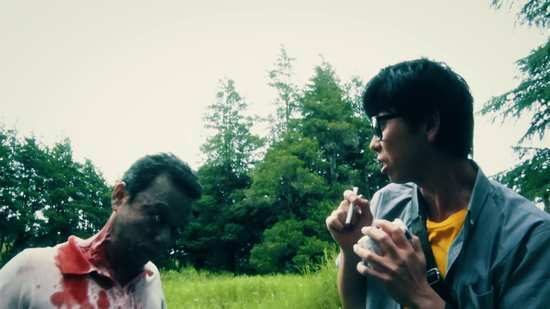 One Cut of the Dead certainly manages that with its first act. The film is a zombie movie within a zombie movie; a film shoot going horrifically off the rails, and the first act is shot as one take, the one cut of the title, a terrifically staged and wonderfully executed sequence that grabs the attention. The second act of the film slows things down a bit, completely changing pace and tack, and you’ll be forgiven for wondering just in what direction the film is going. That’s all made clear in the final act, which is a work of absolute genius. I’m not the greatest zombie movie fan, but One Cut of the Dead certainly impressed me with its initial technical accomplishment. Yet it’s how the rest of this wonderful film plays out that elevates it to sheer brilliance. I’m reluctant to even relate just how it made me feel, for fear of spoiling it. There was a time when TV drama used to be shot as live. Anyone who’s seen William Hartnell flub a line in an early black and white Doctor Who serial can attest to that. Even today on rare occasions, TV producers will try again, often as a gimmick to catch an audience, and we’ll get live broadcasts of soaps like Eastenders or Corrie, dramas like Casualty and E.R. I will never look at these programmes in the same way again.